Trays in all boxes match the wood used for the body of the box. Dividers are alder, dyed black. Bottoms (including drawers) are lined with black UltraSuede. Please note that the Large Double Decker (bottom left) is 4" wider and 1" deeper (front to back.) That's 40% larger than the regular Double Decker. Large Double Decker interior is configured exactly like regular except larger. Most Single Level boxes are the same dimensions as Double Deckers upper section. Double Decker and Single Level boxes can be purchased without the tray and dividers. We would deduct $40.00 in that case. Contact us by email or phone (208-345-6384) before purchasing and we can quickly edit the purchase page. Regular Double Decker interior. Tray slides on top of dividers. Regular Double Decker interior dimensions. Blackwood, African: Among the very finest of all turning woods. Very hard and dense wood often used for woodwind instruments. Native to seasonally dry regions of Africa from Senegal east to Eritrea and south to the Transvaal in South Africa. Very expensive. Bloodwood: Also known as satine. One of the few red woods that darkens a bit but keeps it's rich color although you should avoid bright light. Dense, tight, straight grain. A delight to turn. Central and South America. Bocote: Quite hard and dense. Yellowish, even greenish brown with very dramatic dark brown to almost black stripes. Color tends to darken and mellows with age and loses the slight greenish tinge. Also, the grain patterning can be quite striking, particularly on flat sawn areas. Mexico and Central/South America. Bubinga: Heartwood ranges from a pinkish red to a darker reddish brown with darker purple/blackish streaks. Nice wood to work if a bit hard on the tools. Often occurs with some striking figure types: pommele, flamed, waterfall, quilted, mottled, etc. Pomelle Bubinga is one of our all time favorite woods. Also known as Kevazingo. Equatorial Africa. Camphor: Softer than cherry it can have a lovely reddish brown color. Occurs as a gorgeous burl too. Odor is very strong and spicy - can drive you out of the shop! Native to southeast Asia, widely planted throughout tropical and subtropical regions worldwide. Canarywood: Pale yellow-orange to a darker reddish brown, usually with darker streaks. South America. Cedar: Many people are familiar with Aromatic Cedar from eastern North America but there are many types of cedar: Atlantic White, Port Orford, Northern White, Alaskan Red, Incense (think pencils). "Spanish Cedar", used in humidors, is not a true cedar and is closely related to true mahoganies. Cherry: Black or American are the types of Cherry familiar to most people. Terrific wood - one of our favorites. Cherry will quite quickly darken to a richer, beautiful tone - it ages gracefully. Eastern North America. Cocobolo Rosewood: This rosewood (Dalbergia) has taken over the premier spot after harvesting Brazilian Rosewood was (properly) outlawed. Oily, nice to turn, it can vary considerable in it's rich color and grain patterns. Does oxidize (muted color) eventually. Dense, it polishes to a wonderful sheen. Difficult to glue due to oiliness. Central America. Hawaiian Koa: Gorgeous wood, becoming harder to find, we've don't really search for or order Koa anymore and only buy small pieces as we bump into to it. Decided years ago to leave it to the local Hawaiians to use. Very strict harvesting is helping to keep this wonderful wood from disappearing. Medium hard, polishes wonderfully. Varies tremendously in color and grain. The old stuff we used to use came in a rainbow of colors - brilliant golds, reds, and blues even. Honduran Rosewood: Honduran (or "Honduras") Rosewood has grown difficult to obtain. Denser than Indian Rosewood, Honduran Rosewood is well known for its tonal properties. Nice deep brownish-purple to a light-brown. Somewhat threatened. Belize. Jarrah: Very hard and dense. Can display terrific figure and burl. A eucalyptus, it is native to the southwest of Western Australia. Lacewood: There is some confusion when it comes to Lacewood. It is often confused (and vice versa) with Leopardwood (below) which is from Brazil. I alway think of "Lacewood" as being an Australian wood sometimes called Silky Oak. Australian Lacewood is much less dense than Leopardwood - almost to the point of useless sometimes. They both have remarkable grain due to intersecting the wide medullary rays resulting in flecking reminiscent of quarter sawn oak. Leopardwood: See "Lacewood" above. A fairly hard wood it is also splintery (course texture) and can be a pain to use. Beautiful though! Remarkable grain due to the wide medullary rays resulting in flecking reminiscent of quarter sawn oak or sycamore but easily lost with improper sawing. Brazil. Ebony: Ebony (there are 400+ species of ebony) is a dense black hardwood, dense enough to sink in water. It is very finely-textured and has a very smooth finish when polished. We use two types. Macassar Ebony is found almost entirely in smaller, remote areas of Indonesia. It is black with chocolate stripes. We occasionally use it as inset in our box lids. Gaboon ebony is the classic deep jet black ebony with no visible grain. one of the hardest woods and quite a remarkable wood really. We use reject fingerboards for our handles as it is listed as endangered. Equatorial West Africa. Makore: Also called African Cherry. Works well but you'll make a trip to your tool sharpener after working much Makore - one of those woods that dulls tools. worth it though, it can have a lovely color and subtle grain that is simply beautiful. One of my favorites. Displays tiger, bee's wing, pomelle figuring. It occurs in Cameroon, the Republic of the Congo, Gabon, and Sierra Leone and is threatened by habitat loss and overharvesting so we restrict our usage. Maple: Bird's Eye, Tiger, Fiddleback, Hard Eastern, Northwestern Bigleaf. Origins from eastern to western to midwestern and Great Lakes. Add to that varying hardnesses from very hard (Eastern) to very soft (Bigleaf.) Again add the variety of figure: tiger, fiddleback, bird's eye, quilted, spalted and you have many, many kinds of maple. Padauk: The vivid orange color of African padauk wood is, yes, 100% natural. As African padauk ages, the orange color of the wood usually turns dark – sort of a maroonish brown. It can end up a pleasant color but we don't use it because just can't trust the outcome. Palm: We use three types of palm - Black, Red and Royal. The end grain of almost all palms is quite interesting. 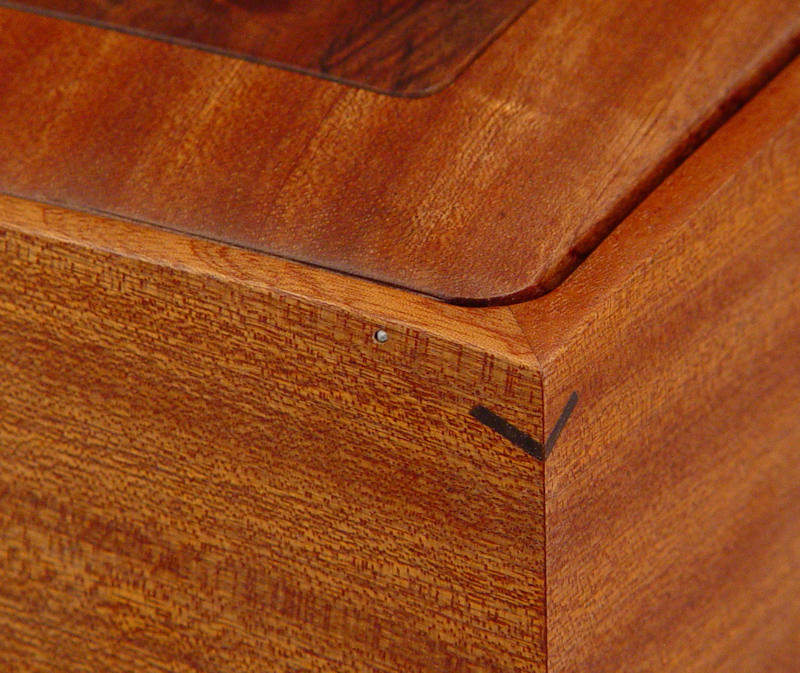 The side grain is too but needs to be cut just right to get the interesting grain hidden in the wood". Black palm has jet black "dots" surrounded by chocolate. Palm is actually a grass. The "rods" you see in the side grain are the black dots in the end grain. It has to be interesting or no one would come close to it - miserably splintery. You are lucky to find it any larger than 1" thick by 4"-5" wide as that is how palm grows - just a fairly thin outer ring of growth, the interior being incredibly punky. Did I mention it's a grass? Pao Ferro: Also known as morado, palo santo, caviuna, Brazilian ironwood, and Bolivian rosewood, Santos rosewood. Pao Ferro is Portuguese for "ironwood". Similar to a rosewood but not as oily and not a true rosewood. A beautiful wood to work, one of my favorites. Silky to cut and machine even though it's quite dense. Gorgeous color with, if you're lucky, nice subtle streaking. Peruvian Walnut: Also known as Tropical Walnut, Nogal. We use this for splines and the dark strip atop the feet of our double decker boxes. It turns almost black when oiled then finished. Can be fuzzy though and no fun to work. Softer than regular walnut. Purpleheart: This is a perfect example of how a wood can oxidize to a totally different color than expected. Indeed it is bright purple - then it's not. Starts out when cut as dull grayish purplish, brightens to an eggplant purple then oxidizes to dark brown with remnants of the purple. Sapele: This is the wood we often use when we want a "mahogany" look. We are always looking for some of the figured sapele that is around - pommele, quilted, mottled, wavy, bee's wing, and fiddleback than can be absolutely stunning. Golden brown to a nice dark reddish brown. Pleasant to work with. Tropical Africa. Shedua: Also knows as Amazique, Amazoue, Mozambique, Ovangkol. In the same family as Bubinga. Hard with somewhat course texture, often with great figure, tends to have a yellowish green tinge that will change to golden brown if you're lucky. Snakewood: World's most expensive wood by board foot. We use it very sparingly of course. The door of our Wing Cabinet has some Snakewood inset in the front. 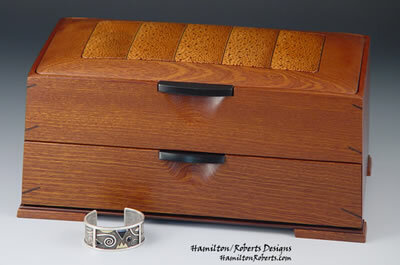 Spalted Maple: We use quite a bit of spalted maple and spalted maple burl in our lid inserts. Almost entirely Western Bigleaf Maple from Oregon. Spalting refers to partial decay of the wood due to exposure to fungus in the soil the wood lay on for a while. Timed correctly this decay is aborted and the wood is consolidated (hardened) and treated as any wood. The result is usually black lines bordering between the normal wood and the "decayed" wood, with sometimes spectacular results! We go through a long process of hardening the punky areas - either using a vacuum displacement system or cyanoacrylate glues. Teak: We use little strips of teak for our drawer runners! Self-lubricating. That's about it unless someone asks for a custom teak box. Walnut: Many varieties. Also called American black walnut, American Walnut, Black Walnut, Eastern black walnut, etc. We also use our favorite, by far, walnut - Claro Walnut from California and Oregon. Occasionally called California Black Walnut. The highly colored (browns, reds, black, purple, yellows) and figured Claro Walnut is produced from wood from orchard trees that have been grafted with English Walnut (Juglans regia) that may have a colorful/streaked appearance near the graft, which is also sometimes referred to as “marbled Claro Walnut". Wenge: Very hard and splintery - just looking at Wenge will result in splinters in your hand. Honest! Almost jet black but usually has chocolate colored background although that can darken considerably. Tropical West Africa, Zaire, Cameroon, Gabon, Tanzania. Zebrawood: also known as Zebrano. Looks like it sounds. Straw colored wood with distinct dark brown to black streaks. Usually quarter-sawn to display the streaks best. Very bold wood - not sure you would want and entire dining table made from it. Interlocked grain makes for difficult working. West, Central Africa. Ziricote: It is a hard, dense wood, with a medium texture. The color ranges from reddish brown to dark brown with unusual black streaks. Not uncommonly displays "reverse grain" or "landscape grain" where the grain seems to dive behind other grain. Very unique. We use the end grain slices to laminate, say, six panels together for a very striking effect, The header image on our Home Page is an example. Belize, Guatemala, and Mexico. I have some quibbles with the chart below! No way is Cocobolo (Rosewood) softer than S. American Mahogany, Zebrawood and Padauk. The Peruvian Walnut I use is softer than Teak, Walnut, Cherry, soft Maples, Imbuia, etc. I have some quibbles with this chart! No way is Cocobolo (Rosewood) softer than S. American Mahogany, Zebrawood and Padauk,. The Peruvian Walnut I use is softer than Teak, Walnut, Cherry, soft Maples, Imbuia, etc.